Having safely boarded the New York bound train, Lucy realizes she has left her purse containing the tickets on the Union Station platform. With just a few moments before the scheduled departure, Ricky rushes off to retrieve the pocketbook while Lucy pleads with the conductor to hold the train. The conductor flatly refuses, so Lucy is left with no alternative but to pull the emergency brake, causing the train to come to an abrupt halt. Conductor: "Madame, did you stop this train by pulling that handle?" Lucy: "Well, I didn't do it by dragging my foot." A mixup with Mrs. McGillicuddy's tickets results in Lucy having a run-in with a gun-wielding jewelry salesman whom she assumes is responsible for her "missing" mother and son. Panicked, Lucy pulls the ermegency brake again. 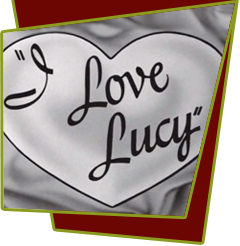 When questioned by a detective concerning a jewel thief suspected of being aboard the train, Lucy warns him about the gun-toting man in the next compartment. However, the real jewel thief fools Lucy into believing he's with the FBI and wants her to cooperate with him in locating the salesman with the valuable jewelry collection. When Lucy realizes that she's made a mistake, she again beats a hasty path to the emergency brake. The ensuing chaos permits the criminal to be captured, and Lucy winds up a heroine. Special Notes: To simulate the emergency braking of a speeding train, Desilu Productions was not content to use a standard method of jolting the camera and having the actors move in reaction to a non-existent jolt. Desilu wanted absolute realism, so the set containing the train's curtained berths and a hallway leading to the door with the emergency brake next to it was built in a box frame that contained a spring mechanism that was in turn triggered by the emergency brake itself. When Lucille pulled the handle of the brake, it released a metal spring that caused the entire set to lurch forward in a movement that often brought the actors to their knees; thereby accurately simulating an emergency braking of a train's movement. Frank Nelson, who played the conductor on this episode, joined the series the following year as the Ricardo's neighbor, Ralph Ramsey. This episode features Sam McDaniel, brother of Oscar winner Hattie McDaniel of Gone with the Wind, making him the only African-American to ever appear on the show.